Chorizo is kind of a Spanish Salami - and likewise, the Seat 800 is a variation of an Italian car - the Fiat 600. While the 600 wasn’t a huge success in Italy, it completely dominated the sales charts in Spain as it was the first car that came within the modest but rapidly growing economic means of most Spanish families from the mid-1960s to the early 1970s. The vehicle has become an icon of the period. Seat in Spain however didn’t produce Multipla version for commercial purposes - instead, they made this - the Seat 800. Seat stretched the wheelbase considerably and created this four door car. It was mainly used as a Taxi like this model here - or bought by very large families. The 800 had the same “100 Series” engine found in the 600 model. By then, it had grown to 770cc and pumped out 29hp. Yeah. Not really a lot - but somehow, it worked. That engine survived until 2010 in the Polish made “Seicento” models, although by then it worked in the front of the car and propelled the front wheels. Seat produced 18,000 of the 800 models between 1963 and 1968 - a drop in the ocean compared to the 800,000 they managed to sell of the 600 model. So survivors are rare today, as most of them led hard lives. 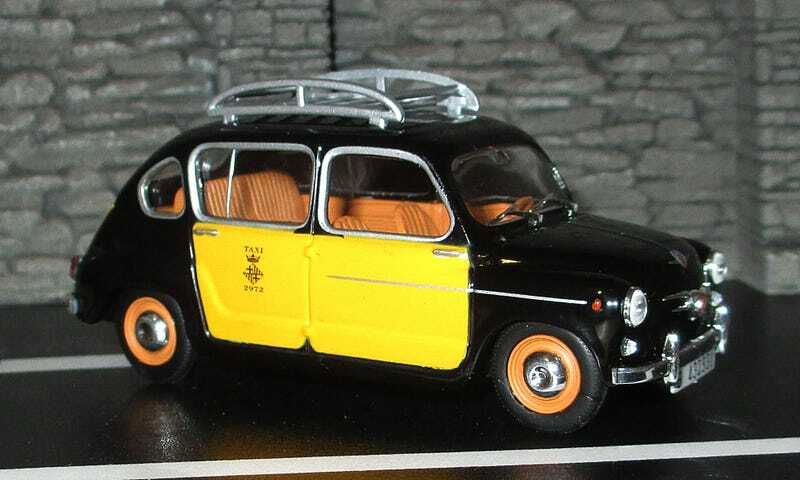 The model is a 1/43 scale by Solido - all dressed up as a Barcelona Taxi. Very nice details inside and out, though the wipers do look a bit wonky.